The Ageless Authors Anthology proves that while old age may rob you of some function, Father Time doesn't necessarily take away your creativity. This volume is an extraordinary collection of poetry, essays and short stories from the Ageless Authors Writing Contest exclusively for writers age 65 and older from across the country. A second contest is now underway at agelessauthors.com/current-contests/ and the best writings will comprise the next edition of Ageless Authors Anthology in the fall. For this book, 52 senior writers contributed work that showcases the experience inherent in this older group. Some of the writers are widely published, while others have been toiling away in relative obscurity and this is the first time they've published their work. These writings are entertaining and memorable. From writer and composer Michael Coolen in Corvallis, Oregon comes the opening sentence you can't forget, "Dad was killed by whales." The late John Garzone of Lenox, Massachusetts tells the story of the female pool shark who stole a young man's heart in "Smooth Sheila." And Shirley K. Wright of Coppell, Texas weaves a suspenseful tale of a home invasion in the expanses of the Texas Hill Country in "No Thanks For the Memory." 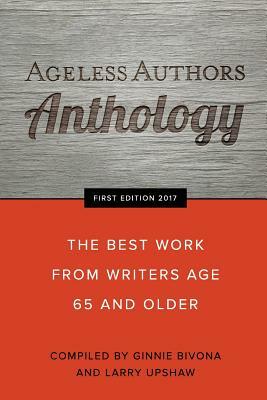 Ageless Authors is the brainchild of Dallas writers Ginnie Bivona and Larry Upshaw, who compiled the work for this collection. Bivona is an 86-year-old novelist and poet who started writing in her fifties. Upshaw is a 70-year-old former journalist, ghostwriter, and marketing executive. They set out to prove that no one has to shut off their brain when they reach a certain age. "Ageless Authors captures the best offered by seasoned writers," says Vermont essayist Jean Yeager. "I'm grateful to be judged against my peers. We may be the fine aged wines of the writing world." Ageless Authors Anthology makes a great present for family, friends and especially seniors who are struggling to keep the creative fires burning.